Part Number VS1GB333. Bus Clock 333MHz. Speed PC2700. Manufacturer Corsair. Format DDR. Capacity 1GB. Error Correction None (Non ECC). Revision / Version -. NEW OPEN BOX. In the unlikely event there is a problem with your item we are always happy to investigate and resolve issues. Bankers Draft. Credit or Debit Cards. We are one of the UK's largest suppliers of refurbished RAM. All RAM is fully tested and includes a warranty. About This RAM All RAM is security marked with a warranty void sticker. Storage Location: RAM. 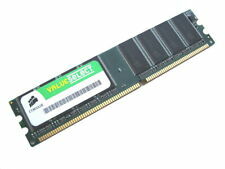 Type: DDR 200-PIN DIMM. Capacity: 1GB. Manufacturer: Samsung. To Fit: Laptop. International Orders. Bus Clock 333MHz. Speed PC2700. Part Number KTC-D320/1G. Manufacturer Kingston. Format DDR. Capacity 1GB. Form Factor 184 pin. Revision / Version -. Model: Infineon 1GB DDR 333 CL2.5 EEC (1x1GB) CL2.5 Part No: HYS72D128300HBR-6-C Fully tested and 100% working. Dispatched within 1 working day of cleared payment, in anti-static bag and well packaged. 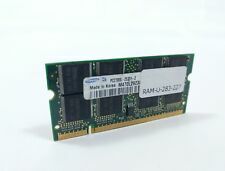 Ram Module 1gb Ddr 333 Pc 2700 New! Hypertec 1Gb DIMM DDR PC2700. Taken from a Dell Optiplex GX270 but should work with other similar models. -Memory size: 1GB -Memory type: DDR SDRAM (double data rate synchronous dynamic random access memory), twice the bandwidth of SDRAM -Memory clock speed: 333 Mhz CL 2. Bandwidth :- PC2700 (PC333). Form Factor :- 184 Pin Dimm. Capacity :- 1GB Module. This success has been built on a number of core principles :-. A huge database of information allows us to provide upgrades for almost any computer. Model: HYMMS2401G. Manufacturer: Hypertec. Type: DDR 200-PIN DIMM. Capacity: 1GB. To Fit: Laptop. International Orders. Hypertec 1GB RAM (1x1GB Module) PC2700 SODIMM. Bandwidth :- PC2700 (PC333). Capacity :- 1GB Module. This success has been built on a number of core principles :-. A huge database of information allows us to provide upgrades for almost any computer. This success has been built on a number of core principles :-. OFFTEK Part Number :- FT128MLD64V3J. Bandwidth :- PC2700 (PC333). Capacity :- 1GB Module. A huge database of information allows us to provide upgrades for almost any computer. Useful information. In the unlikely event there is a problem with your item we are always happy to investigate and resolve issues. Bankers Draft. Credit or Debit Cards. Joblot of DDR 333 and 400 1gb Modules, pulled from working computers. 4x DDR 333 (2700) 1gb. This success has been built on a number of core principles :-. OFFTEK Part Number :- FT1GAPG4333S. Bandwidth :- PC2700 (PC333). Capacity :- 1GB Module. A huge database of information allows us to provide upgrades for almost any computer. This success has been built on a number of core principles :-. OFFTEK Part Number :- FT128MSD64V3A. Bandwidth :- PC2700 (PC333). Capacity :- 1GB Module. A huge database of information allows us to provide upgrades for almost any computer. RAM Features: Unbuffered. Type: DDR SODIMMRAM. 2x1GB, 2x1024MB, DDR1, 333MHz, PC2700, Non-ECC, Unbuffered,, 184-pin, DIMM. FULLY TESTED UNBUFFERED NON ECC. Desktop RAM. Compatible with multiple systems. Gaming PC take a little bit longer usually is dispatched after 48h. You will receive what you have bought. No collections allowed. You will receive one stick of Kingston. This is non-negotiable. This success has been built on a number of core principles :-. OFFTEK Part Number :- FT1GIB9834. Bandwidth :- PC2700 (PC333). Capacity :- 1GB Module. Lexmark (IBM). A huge database of information allows us to provide upgrades for almost any computer. Integral Part Number:IN1T1GNRKBI 20-16-79. Rest of the World. Cheques (Subject to Clearance). Compliance: PC2700. Capacity: 1GB. ComputeUK - Suppliers of new and used Computer and IT related products. Integral IN1V1GNRKBX. Bus SpeedPC2700 (DDR 333MHz). CAS LatencyCL2.5. ProfileStandard Profile. Form FactorDDR SO-DIMM 200-Pin. Type: DDR 200-PIN SO-DIMM. Capacity: 1GB. To Fit: Laptop. International Orders. Model: D333SB1G. Standard: PC2700. Type: DDR 200-PIN SODIMM. Manufacturer: Super Talent. Capacity: 1GB. To Fit: Laptop. International Orders. Technology : DDR RAM. RAM Features: Unbuffered. Latest technology Products. & Free technical support. Why buy from us. Condition: New. Part Number: M312L2920DUS-CB0Q0 / HP Part Number:261585-041. Administrative Use Only:M2020 04070604. Standard: PC2700. 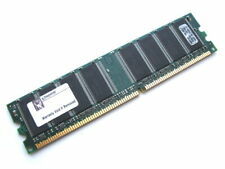 Type: DDR 200-PIN SODIMM. Manufacturer: Kingston. Capacity: 1GB. To Fit: Laptop. International Orders. 2gb Kingston KVR333X64C25/1G 2x1gb PC2700 DDR-333 DDR SDRAM 333 MHz DIMM 184-PIN You will receive 2 sticks of RAM 2x1gb This was taken from scrapped Desktop PC It was booting to BIOS but I did not made any other test. Also you have to make sure it is compatible with your specific motherboard. It does not have to work in every motherboard especially this being old DDR1 RAM. NO RETURNS ACCEPTED ON THIS ITEM !! !